A small village with a big name, Ashby Puerorum owes its unusual moniker to a 13th-century Bishop of Lincoln, Oliver Sutton, who renamed the village when he decreed that all profits from the living here should go to support the choirboys of Lincoln Cathedral. The name 'Ashby Puerorum' translates loosely as 'the little boys' Ashby'. The connection is remembered over 7 centuries later, for the choir still sings at St Andrews church occasionally. The village dates to at least the late Saxon period and was mentioned in the Domesday Book of 1086 when it was owned by Bishop Odo of Bayeux, William the Conqueror's half-brother. At that time it was called Ascheby, meaning a farmstead where ash trees grow. It supported a population of 9 villagers, 2 smallholders, and 14 freemen. The Saxons were not the earliest settlers here, though; in 1794 a labourer digging a ditch unearthed a Roman sepulchre and found a glass urn inside a stone chest. The most interesting historic building is the church, which dates to the Early English period (loosely 1200-1300), with the addition of a 15th-century tower and windows in Perpendicular Gothic style. Within the church are a pair of very fine memorial brasses to Richard Lytleburye (d. 1521) and his wife Elizabeth (d. 1523). The font is 15th century, very plainly carved. Under a carpet at the base of the altar is the grave slab of a 14th-century priest. In the tower are a pair of early medieval bells. The oldest bell is said to date from around 1150, which would make it the oldest surviving bell in the county. 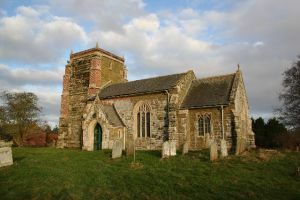 The church is set beside a farmyard and from the churchyard there are excellent views out over the Lincolnshire Wolds. The manor house is Holbeck Lodge, built in 1823 to replace an earlier house. The manor is sometimes known as Clapgate Lodge, a reference to an old tale that Civil War soldiers gathering here on the eve of the Battle of Winceby in 1643 were alarmed by the clapping noise made by the lodge gate. Less than 4 miles away is Bolingbroke Castle, the birthplace of Henry IV.